I fess up that I Tex-Mex'd this New England favorite with jalapeño and Mediterranean'zd it with olive oil. Then I went and made it milk and cream free, skinny. The sheer irreverence. I should have just called it Summer Corn Soup but I find corn and New England clam chowder, exotic. Speaking of skinny, I have started again going to the gym regularly. I am back, though a long way from whipping myself back into the shape I was in a couple of years ago. I even started to Zumba for the first time, though I probably look completely ludicrous doing it. You have to see the instructors quivering, muscles that I didn't even know existed, as if we were at a Mardi Gras parade in NOLA or at Carnival on streets of Rio. Skinny isn't really the goal as much as feeling healthy. The endorphins are pumping. I feel happy. I do eat in moderation but I haven't given up My Lunches with Jeanne and my mini DC food crawls. Back in April this year the Washington Post Cookbook was published and one of my recipes, Quince Honey Challah Knots, made it through to the pages. A different photograph I took of the challah knots was also published along with the recipe. Thank you, my friends on Twitter and Facebook, who came to my rescue, explaining chowder. I served this soup along with Tex-Mex chicken fajitas with whole wheat tortillas, home-made salsa, this time I didn't roast the vegetables, and guacamole. The contrast of the super sweet, in season, corn and the kick from the jalapeños, in the chowder, was distinct, opposite yet harmonious. Remove the corn kernels from the cob with a knife as shown in this NYT video. I slice the kernels off the cob as shown in the first technique. Do not pre-cook the corn. Core and seed the bell pepper and stem the jalapeños. Grill or broil the peppers until charred on top and flip with a stainless steel spatula and continue charring on the other side. Take the bell peppers out and let cool. Dice with charred skin on. In a large pot over medium heat sauté the onion in the oil until it turns soft and translucent. Add the corn and potatoes and continue sautéing for a few minutes longer. Add the chicken stock jalapeños and bell peppers and cook until the potatoes are fork tender and fall apart. Mash the chowder slightly with a potato masher to thicken the soup. Some of the potatoes will mash. Serve hot. Keeps well refrigerated and gets thicker the next day. 1. This soup didn't need any additional salt. The chicken stalk had salt in it. Just as a general rule, when it comes to corn, I find that, because of the sweetness, it does not require any, or much added salt. 2. I used only 1/2 of a bell pepper. The other 1/2 I used as a layer in a sandwich. You absolutely can use the entire bell pepper in this chowder, if you wish. Love the Tex Mex flavors you added! Comforting, flavorful and extremely enjoyable! Lovely bowls and tray. TY Rosa. Somehow pairing the contemporary bowls with rustic worked. Light.... easy.... perfect for spring and summer. Oh my goodness Shulie! Love the spice you added and making it healthier. 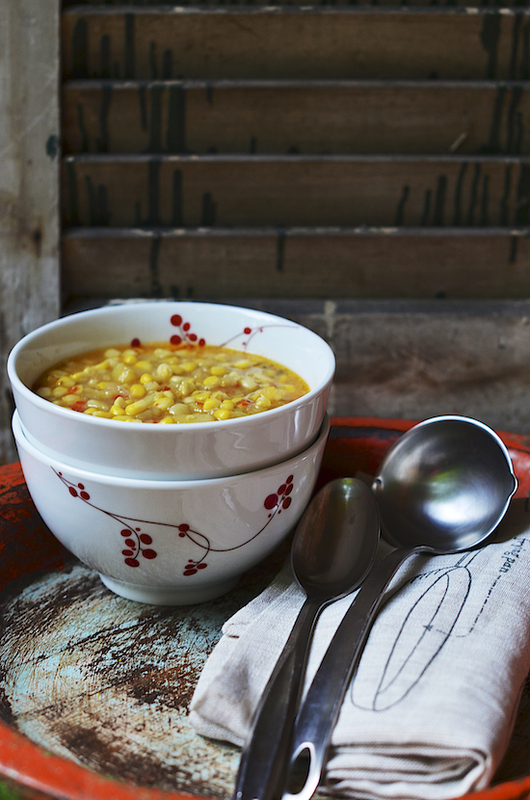 I'm a major corn lovin' gal (comes from being Southern I think) and what a "chowdah" for me. I swear I need lessons in Southern cooking & TY Renee. Whatever you did to this soup...it looks and sounds amazing. And good for you being back at the gym! I agree, it isn't about looking or being skinny, it's about feeling good! Thank you for sharing. I hope to make this soon! The jalapeños were spicy this time so two have it a real kick, just to keep in mind, Monet. 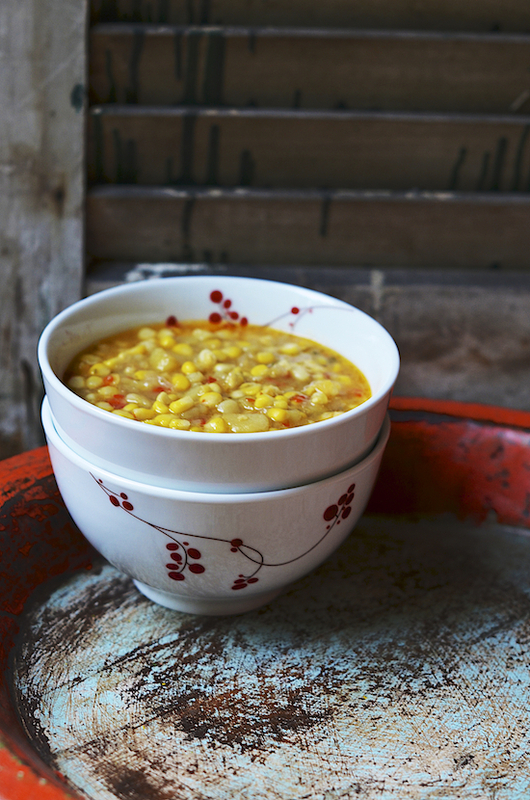 I´ve never made corn chowder because of the cream, too much for a soup. But this version is spot on Shulie! I adore corn. And should get to the gym again too. Funny as much as I find regional cuisine fascinating, I too with some exceptions like mushroom soup done right, do not like cream in soups. Corn in the Americas, no surprise, is so good. המון תודות וויני. אני ממש מעריכה את זה. מזג האוויר פה יחסית סביר שזה מפתיע ליוני בדי.סי. Having grown up in Illinois, surrounded by corn fields, I love anything corn! This looks so light and well, corny. Can't help if it's true! Will definitely be doing this! And sigh, I should be Zumbaing, too! Ha ha./.I love how you put the New England accent on your corn 'chowdah'. So many years it was the norm when I was in collage in Boston..although of the creamy clam variety. Your light and lean corn 'chowdah' looks to be warm and cozy enough for the Fall and Winter..yet light and sweet enough (the amazing summer bounty of corn) for Spring and Summer. By the way, I'm completely enamored with your quince challah knots! ps: i need a yoga partner to get into a routine. sigh. Ahaha I don't know if technically this is a chowder but it does get the corn milkiness as it sits for a day or two. I would totally be your yoga buddy if we lived closer. A great twist on a classic, Shulie! Shulie, I am envious and delighted at the same time that you have your mojo back! I was starting to swim and go to the gym regularly before breaking my darned foot! Post op now... hope to swim again from this week... enjoy yourself, you sound like you have a whole lot of energy. Love what you've done with the soup! It's winter where I am but I'd still eat a huge bowl of this.